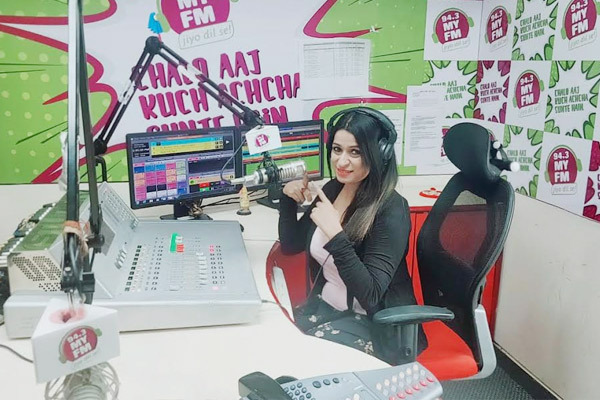 MUMBAI: Radio is a powerful medium, today, that has a strong emotional connect with the audience and RJs these days enjoy a celebrity like status and a humongous fan following. RJ Meenakshi of MY FM, Chandigarh is one such massively popular RJ, who recently garnered four lakh likes on her Facebook page. "I am not on cloud nine but on cloud ten. When people say my name is equivalent to MY FM, it feels my hard work for 12 years has paid off," exclaims the ecstatic RJ. From playing hit songs to sharing juicy Bollywood gossip to raising socially relevant causes, Meenakshi's show Salaam Chandigarh handles multiple issues. "My show reaches out to a wide audience. Thus, a lot of hard work and research goes in the backend, especially, when the topics are of socially relevant issues. For instance, currently, citizens of Chandigarh are facing the issue of rising price of water. We put the Mayor on air to connect with the citizens. This issue requires some scripting, but a lot of my ‘on air’ presentations are impromptu also. It's a mix of both,” clarifies RJ Meenakshi. Undaunted by fan emails and calls, RJ Meenakshi cherishes noteworthy fame. “While one fan of mine has recordings of my show for past five years, another fan came along with his mother asking for my Rishta," says an amused Meenakshi. Apart from the adulation, there are times of some social media outrage too. On this, the talented RJ says, "Yes there is, but it is minuscule and can be overlooked." Considering the status that RJs enjoy, it is clear that Radio is here to stay and Meenakshi agrees with the same. She said, "The surprise element in Radio can never be replaced. On the internet, you can pick and choose the songs you want to hear, but the joy of suddenly getting to hear your favourite track is amazing. Also, there is two-way human interaction in the radio medium, which is absent in other mediums." The RJ is more than happy working at MY FM, "MY FM is family. It gives you the leeway for the creativity, freedom to explore. They want results, but if you are an employee or a part of MY FM, they go out of their way to help you in any of your personal crisis and make your joys double," signs off Meenakshi. MUMBAI: With another weekend making its presence known, it’s time to see off the preceding week. But, the previous seven days, had some striking news that created a buzz. MUMBAI: RJ Meenakshi, from 94.3 MY FM, recently walked the ramp with the specially challenged kids. She was the special guest of honour at the event, organized by an NGO called EmPower DIVA. MUMBAI: As another weekend comes to an end, we are back with the previous week’s quick wrap-up. Check out the article, to know the top news, from the music industry that left us awestruck! MUMBAI: RJs from different radio stations working are always tagged as ‘competitors’. But, this myth was broken by Radio Mirchi and MY FM in Chandigarh, who had a ‘hug’ moment. MUMBAI: In a first-ever, an exchange program curated by US Consulate was held for Radio medium. As a representative from India, RJ Teena of MY FM was sent.